Today it’s good to feel worked from training. I started back training last night at the new Fort William bouldering wall. Campusing felt really alien! I enjoyed it so much though. If I can achieve my goal of getting a proper run of training over the next few months it will feel pretty strange to be in good shape for the first time in ages. That feeling of being stronger than ever before on the rock is something magical and I’ve not felt it for a long time. My strongest memory of this was when I was 17 and going to the Kelvin Hall in Glasgow to train Monday, Wednesday, Friday and then climbing at Dumbarton Rock all weekend. I used to warm up and do an hour and half bouldering, then head downstairs to the weights gym for 2.5 hours of seemingly endless sets of lat pull downs. It was a proper old school free weights gym. If I wasn’t psyched as a mad thing I would have been too scared to go in there. Everyone except me and Claire were massive scary powerlifter types. Maybe I soaked up some of the testosterone haze that floated freely in that place? After my arms were melted I headed back up for another 2 hours mileage bouldering and then 40 minutes on the track before closing time. I’ll never forget pulling back onto the autumns project ‘Pongo’ at Dumbarton the following spring. I just could not pull on the holds but now I could easily float up it like magic! Right, I’m off back round to the boulder wall to attack that board again. Glynn from Scarpa passed by today to drop off Scarpa’s new Veroche shoe which I can’t wait to try out – they look amazing. I’ll post up a review asap. 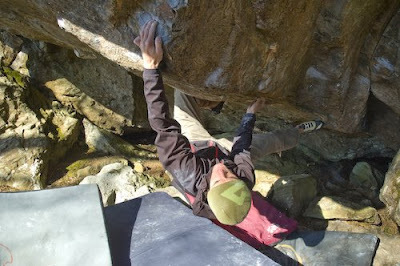 Anyway, here are a couple more beta hits from the new problems I set at the Fort William Wall. I’ll get some more filmed tonight hopefully. 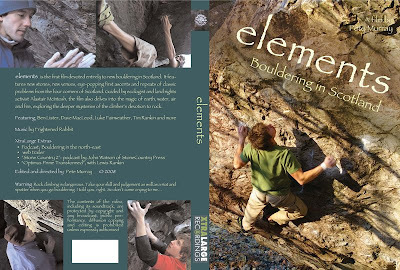 I’ve just got the new Scottish bouldering film Elements up on my shop page finally. Pete Murray has been working on this for the past year so It’s great to see it finished. Because of the beauty of the settings and the variety of the rock, Scottish bouldering always leaves quite an impression on you. Pete has tried to explore our connection with the rock and our moves on it, as well as showing off the new venues that are seeing the action right now. 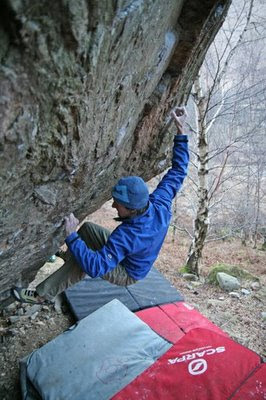 There are lots of new faces in the film including Ben Lister and Mike Lee putting up new problems all over the country. You even get to see Ben putting up a new 7c on a Gritstone crag ten minutes from Glasgow!! 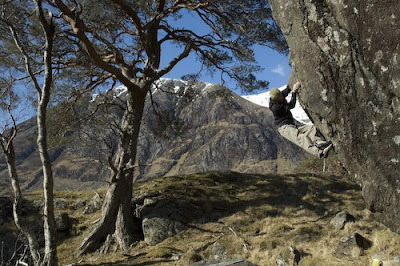 My own feature is a repeat of a very special boulder problem for me –Deep Breath Font 8a in Glen Nevis. A perfect line I came back to year after year. And when I finally did it, it was effortless! The philosophy lost me at times although the interview with a Scottish ecologist was entertaining! It was really the pure bouldering footage that I enjoyed in this film. More power to your camcorder Pete. You can get hold of a copy (with my ebook companion How to Climb Hard Trad as ever free) from my webshop. It has proved somewhat difficult to get any work done over the past week what with the endless days of perfect conditions here. Thankfully the rain is coming tomorrow coinciding nicely with my work trip to England. I have been bouldering a lot. First up I had a lovely day at the Skeleton Boulder and finished the Bear Trap Prow project following the true line of the prow, which went at around V12, I think. It was good to feel the aggression of unleashing full explosive power on the rock again, after the tricky balance of keeping it reserve on long sport routes earlier this spring. I missed the feeling of getting psyched up to squeeze every last muscle fibre. Claire got some nice footage of ‘release of tension’ screams on my failures from the last move of the prow. Today I spent three more hours cleaning some lovely easier problems, a couple of classics, maybe a V8 or so and some other things for next session. I also went over to the other big boulder nearby and managed the stunning crackline there despite Joe noising me up every two seconds (see video). It went at Font 7bish?? 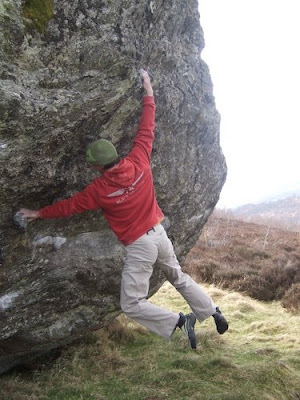 After Pete’s stag do in Aviemore on Sunday I visited the Ruthven boulder for the first time. After a loooong warm up to wake up a hungover body, I looked at a nice bulge called ‘The Dude’ There was an obvious direct version of it with a large dyno to be done. An hour of repeatedly throwing myself towards this blind target was rewarded when I eventually hit the hold dead on for a nice V9 or so (easier for giants I reckon). 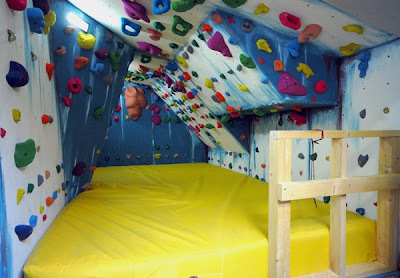 I’m pretty psyched to announce that Fort William has a new indoor bouldering facility at Calluna (Alan Kimber’s place). 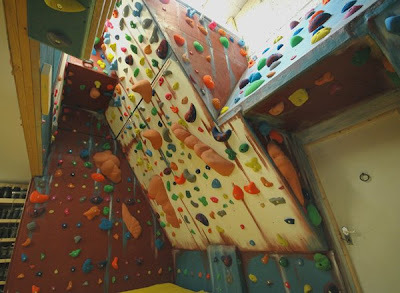 Alan’s built a brand new building with accommodation for climbers and excellent bouldering walls. The wall was constructed over the winter by Scott Muir. Since late February, I have been setting the whole wall with over 60 problems from V0 to V11. It’s got a main area with a large steep wall (37degrees over) and vertical and slabbed walls with an excellent campus board and fingerboard. Upstairs there is a superb little circuits cave with surprisingly long circuit problems on walls and roofs to get fit on. It’s great that the Fort has a great place to train again since the demise of the once excellent leisure centre wall. Full details on how to visit the wall will be on the Calluna site shortly, and the beta for some of the problems are on it’s very own you tube channel here. I have written up the problems into soft, intermediate and hard circuits which are displayed on sheets at the wall so you can easily locate the problems of your chosen level and have a good session. Enjoy, and see you down there, if it ever starts raining in Lochaber again?! When you aren’t so fit, you have to be more proactive about finding good rests. Recovering on Pota D’ Elephant 7c+, Siurana. The coming months are going to be really exciting. For the last couple of years, I’ve somewhat put climbing on the back burner, just climbing routes that would go fairly quickly (NB. My definition of ‘quickly’ may differ from others). 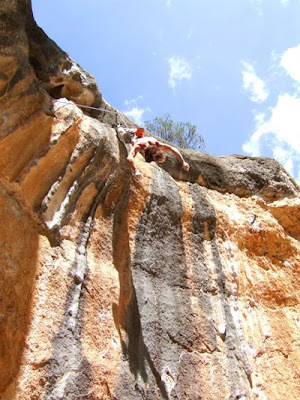 The last time I tried a really hard route was Rhapsody in 2004-6. After I completed that, I knew that I was after another project that would take as much and more commitment, but that it would take some time to find. I don’t think it’s possible to go out and search hard for a route like this, you just need to go out and look and climb until the right inspiration hits you and the right route is there. For something so close to your limit, the chances of the climb being a little too hard (or easy) are pretty high. Of course you can respond by increasing your level, but this takes time. I’ve hopefully found the right project, and so I’m hoping for a good dry summer so I can work hard at it. I tried it before and realised I’d need to be climbing 9a to even be able to try it properly. Now the climbing is more realistic for me, so I should at least be able pull on the holds and move a little and start to make progress. I’ve been saving for two years so I could reduce my work level and train properly if I was ready to have a crack at a project like this. Now that time is getting close. For the rest of April I’m trying to finish as much of my work as I can. 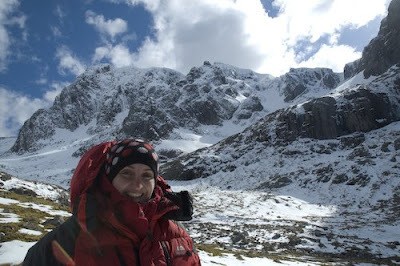 In between writing, I have to go and work on gear design at Mountain Equipment and visit Oxford, Inverness and my local climbing walls for some coaching days. After this, my task is to lose quadricep from the winter’s heavy sac carrying and to get into a good training routine leading into summer. The last time I trained properly was in the ten months before I did Rhapsody. I have really missed the daily routine of getting up and training every single day, for most of the day. I can’t wait to start again.